2017 will be here before we know it — and Top Shelf is delighted to be launching our year with a witty and wise debut from Brooklyn cartoonist Lauren Purje! 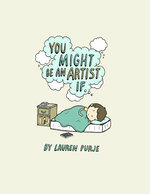 You Might Be an Artist If..., now available for pre-order, is a charming hardcover collecting years of Lauren Purje’s addictively relatable comic strips about the ups & downs of life as an artist. Flights of fancy, bitter grumblings, pep-talks, self-doubt, inspiration, procrastination, and more are all captured with a wry and relatable sense of humor. Capturing the moments that remind us why we take art seriously — but not TOO seriously — Purje’s comics are a perfect handbook for anyone living the creative life. 144-page hardcover graphic novel, 5.75" x 8.25"
Scheduled for release in January 2017, but you can check out an 8-page preview and pre-order it now from your favorite retailer!